As sure as the sun rises and sets, Tax Day comes around every year, whether it falls on April 15th or a day or two thereafter. As part of the Simmons National Consumer Study, Experian Simmons collects information on the various ways Americans file their taxes. In the following post, we will explore a few tax trends in the Land of the Free as well as some deductions available to many. Long gone are the days of preparing our taxes the old-fashioned way using pen and paper (and hopefully a calculator). Last year, just 8.7% of U.S. tax filers prepared their taxes manually, down from 16.4% of filers who prepared their taxes this way in 2006. Software (including both online and offline versions, such as Turbo Tax or H&R Block At Home) have risen to replace their graphite-powered ancestors. 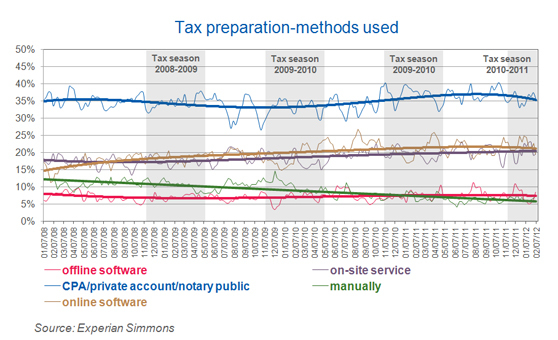 In 2005, 21.5% of tax filers said they used software to prepare their taxes. Specifically, 6.8% used offline software and another 14.7% used online software. Today, 21.5% of filers use online tax software and 7.4% use offline software, bringing the total share of software preparers to 28.9%. But tax software isn’t just replacing at-home pencil pushers. The share of filers using a CPA, a private accountant or a notary public to prepare their taxes has also declined slightly in recent years as has the share of filers that use a professional on-site service, like H&R Block of Jackson Hewitt. In 2011, 30.8% of filers had their taxes prepared by a CPA, private accountant or notary, down from 32.9% who employed this type of professional in 2006. Likewise, 17.7% of last year’s filers used a professional on-site service to prepare their taxes, compared with 19% who used such a service in 2006. Much attention in Washington has been paid to small business owners, especially when the topic of tax policy is concerned. Rest assured, we’re not going to explore the political implications of proposed tax code changes on business owners, but we will examine the way these Americans prepare their personal taxes. A business owner’s tax prep work depends a lot on how many employees they have working for them. 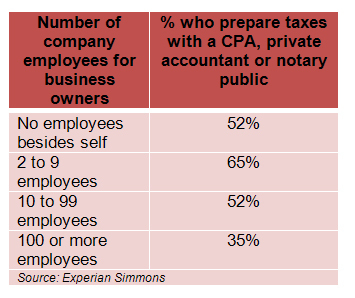 Those who own very small companies with between 2 and 9 employees, including the owner, are the most likely to have a CPA, private accountant or notary prepare their taxes. In fact, 65% of these small business owners do their taxes this way, compared with 52% of those who own companies with between 10 and 99 employees. Interestingly, only 35% of tax filers who own companies with 100 employees or more use a CPA, a private accountant or a notary to prepare their taxes, a rate equal to that of the national average. Larger business owners are actually more likely than average to have their taxes done by an on-site professional. While few business owners do their taxed by hand, the self-employed who have no employees are actually among the few that still do their taxes the old-fashioned way. In fact, 11% of business owners who list only themselves as employees say they did their taxes manually last year, a rate 30% above than the U.S. average. Most of those who don’t to their taxes themselves have them done by a CPA, a private accountant or a notary. Fifty-two percent of the self-employed with no other employees chose this method to prepare their taxes last year, which is a rate 45% higher than the average filer. Deductions are a common way for reducing one’s tax liability. Here we’ll explore how many Americans could benefit from several common deductions allowed by the Internal Revenue Service. For more information about consumer trends, visit www.experian.com/simmons.